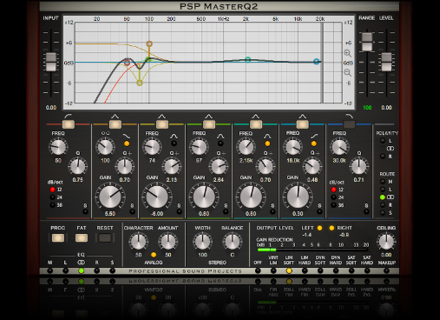 MasterQ2, Software parametric EQ from PSP Audioware. PSP Audioware has released the new version of its MasterQ equalizer plug-in, with a special introductory price until April 1st. MasterQ2 employs a proprietary FAT (Frequency Authentication Technique) algorithm that avois linear and phase errors and prevents from artefacts. 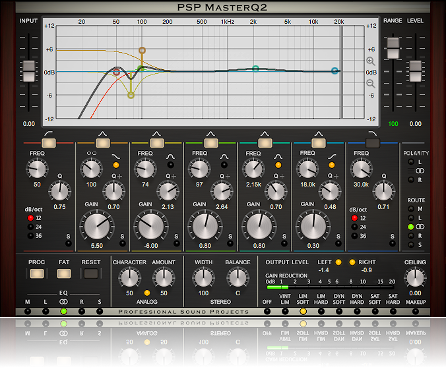 MasterQ2 is a VST, AU, RTAS and AAX 32 and 64-bit plug-in for Mac OS X and Windows. It is available for the introductory price of $99 instead of $149 until April 1st. You can also download a trial version from www.pspaudioware.com. AudioRealism ABL3 will first be for Reason AudioRealism announced on their Facebook page that the next version of their TB-303 emulation will first be launched as a Rack Extension for Reason. Spitfire Leo Abrahams Enigma Redux and a teaser Spitfire announces an update for its Leo Abrahams Enigma library as well as a new instrument teaser. U-he updates ACE, Bazille and Zebra2 U-he announces a small update for its ACE, Bazille and Zebra2 plug-ins, that adds a few new features and fixes.